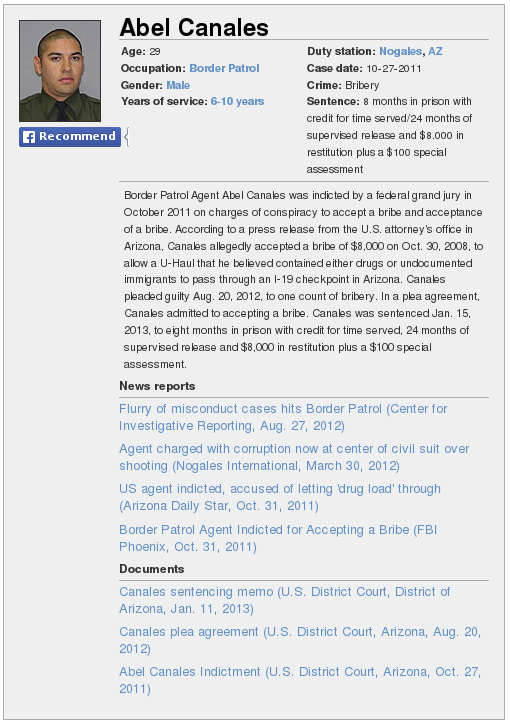 In 2008, CBP agent Abel Canales was observed & documented by gov’t investigators accepting bribes to allow truck loads of illegal narcotics and aliens through the Tucson Sector I-19 checkpoint. For some inexplicable reason however, Canales was allowed to continue operating in the field for over three years until he was finally indicted in 2011. In 2012, Canales plead guilty to a single charge of bribery. During the three years in which a fully armed & corrupt Canales was allowed to continue working in the field, interacting with an unsuspecting public in a position of power and influence, Canales managed to dig his hole even deeper by shooting and injuring for life an unarmed illegal immigrant in 2010. That illegal immigrant turned around and filed suit against Canales and the federal government. Earlier this week, a federal judge largely agreed with the plaintiff and awarded him $500,000 dollars for Canales’ excessive use of force. $500,000 that will ultimately be paid by an unsuspecting public. I suppose we should feel lucky that Canales didn’t do even more damage during his three years of ‘service’ to the country while being allowed to operate with impunity in the public sphere during his corruption investigation. What’s interesting to note is that while CBP takes its sweet time taking corrupt agents like Canales off the streets, it reacts with blinding speed when trying to get rid of agents like Mike Flanders who actually attempt to uphold the public trust in the performance of their duties. The stark contrast in cases like this make it clear where CBP’s priorities really are. As stories like this continue to pour out of the Department of Homeland Security, perhaps the question we should be asking ourselves is while CBP is allegedly ‘protecting’ us from illegal aliens, smugglers, & drug lords, who is protecting us from CBP?